Crop nested compositions to fit the image contents. Useful in cases like Photoshop imports where precomps are created as document size. It makes precomp layers easier to work with as their bounding boxes fit the images, and can speed up rendering by reducing the areas being processed. Written on request for screen graphics designer Mark Coleran, whose work can be seen on the computer screens in movies such as The Bourne Identity and Tomb Raider. 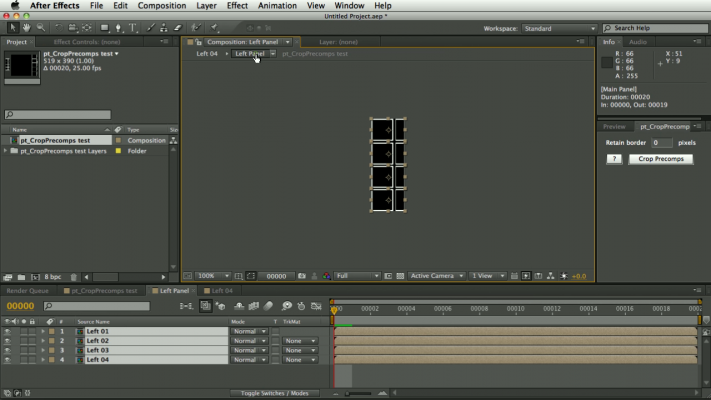 Mark designs complex user interfaces in Photoshop made up of many layers nested into groups, before importing them into After Effects to animate. 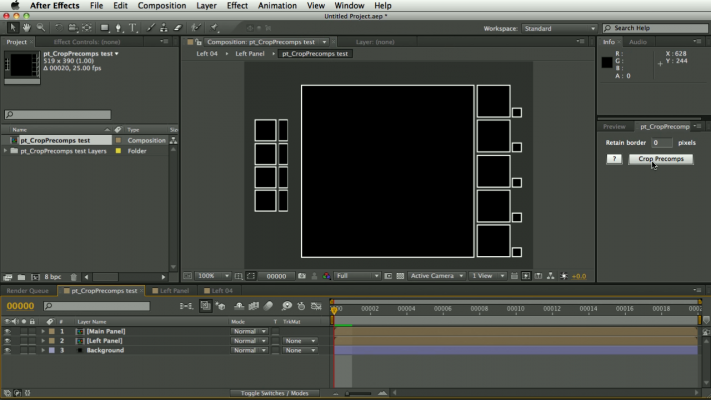 Import a Photoshop file as a Composition using the 'Cropped Layers' (CS3/4) or 'Retain Layer Sizes' (CS5) option. Open the main composition for the file you imported and click the Crop Precomps button. RETAIN BORDER: The Retain Border option lets you expand the area that would otherwise be cropped, so you can keep some extra space for animation or effects. NOTES: The script is intended for use on newly imported or created layers and will not work correctly if they have been scaled, rotated or have position keyframes in AE. It should work with any 2D layers, including text and shape layers. Adjustment layers, and layers that are completely outside the comp boundaries are ignored when calculating the crop sizes, but layers that are turned off are included. Illustrator files won't import as nested comps, but you can import as layers using the 'Composition - Layer Size' option, use Layer -> Pre-compose to group them into nested comps, then use the script to crop those precomps.